Whisky Fringe 2015 was in full swing when we all went outside to try something a bit different, and have a wee pause in the day's madness. 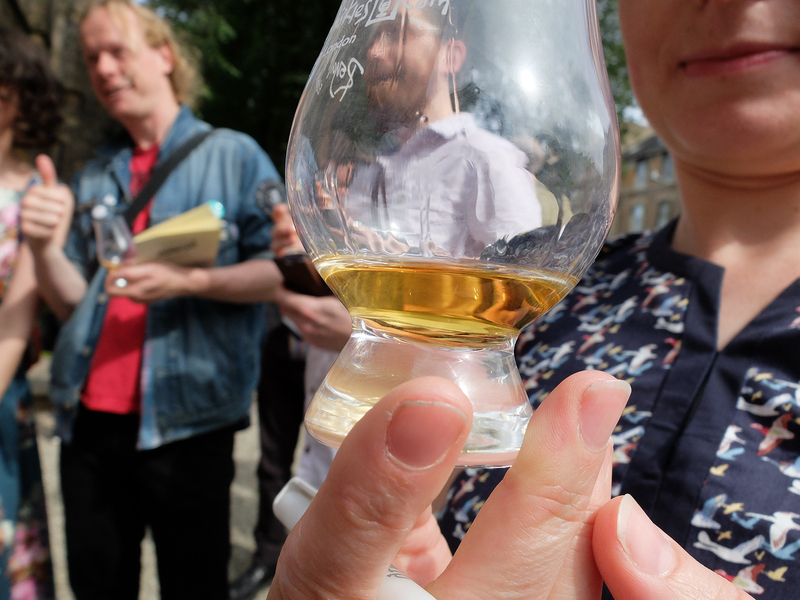 This year's Whisky Fringe was attended by 12 of us, a new record. We weren't sure what to try for a group tasting, but in the end we plumped for an unusual Mackmyra that was aged in Birch Sap Wine casks. It was all fruity richness on the nose, varying from off grapes, raisins and mustiness to fruity, Birch Sap (quel surprise) and Viognier. It then kind of went indoors and outdoors with ashtrays vs freshly cut grass, camping and daisies. Someone suggested 'glamping', but it was immediately shot down. The outdoorsy vibe is over though, with a fire that's gone out (really deep) and finally it sweetens in the form of Muscavado. There appear to have been a couple of camps (not glamps) here, with some getting an intense, dry, woody vibe and some a fruity sweetness - weird. So: Hungover / corked wine, salty licorice, dry wood, lightly woody and winey thing ("yeah"). Very fruity, Chewits, sugary sweet. It was said to be like disgusting sherry (think they were meaning Fino) and REALLY unripe bananas. It was viscous and tasted cold, despite the sunshine. Bitter and drying on the finish, like something sour but without the sour taste. Herby wood. - "Not convinced I want to have it twice." - "This is my second time."